Shi Smith plays wide receiver for the Gamecocks. During his time sharing the position with Deebo Samuel, the two developed a tight bond. Shi Smith is very active on social media. He doesn’t necessarily post a lot of posts but he does post on his Instagram story frequently. On this page we will keep track of some of Shi Smith’s most notable Instagram Live Stories. Shi Smith posts a lot more pictures on his Instagram story than live stories. Shi goes live much more during the course of the regular season. Below you will find some of Shi Smith’s most entertaining and Interesting Instagram stories. The Gamecocks are in the middle of spring practice and that means that the players are having a good time on the practice field and off. Often times when the players are chilling in the locker room before or after a scrimmage, the players play music on the locker room sound system. Many of the players dance around and try to get hype before going out and playing the scrimmage. 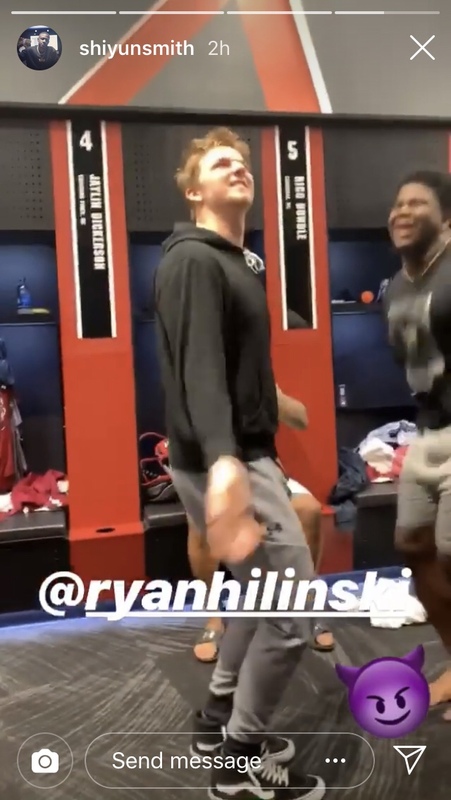 After the first scrimmage was over Ryan Hilinski got in on some of the locker room dancing. Many players captured the dance moves on their Instagram stories including Shi Smith. In the story you can also see Kier Thomas and Jaycee Horn trying to hype Ryan up as he busts it loose to the music.